We meet on Sundays – 1000-1100hrs Boys; 1100-1200hrs Girls. At the start of the season, we are based at Sidmouth, switching to Ottery at half term. After the Christmas/New Year break, we return to Sidmouth until half term, then switching to Ottery for the remainder of the season. For specific dates please look at the Junior News section on the Home page. Our coaches are guided by the England Hockey Player Pathway coaching syllabus to ensure that their hockey skills and knowledge are right up to date and appropriate for the age group they are working with. They devise sessions to meet the development needs of the age group teams and will work with volunteer coaches and assistants to deliver the sessions. Our philosophy to coaching and playing hockey is founded on coaching the basics of the game so that our juniors develop the right techniques and then to give opportunities to transfer them into game situations. A typical session will be made up of: a warm up, skills session focusing on learning new skills. decision making and game knowledge, including rules of the game; elimination exercises – 1 v 1, 2 v 1, 3 v 2 etc; set plays, small sided games finished off with a cool down. Our hockey development programme is led by experienced volunteer England Hockey Level 2/Sessional qualified coaches (min), some of whom have experienced coaching at Development Centre (DC), Academy Centre (AC) and Performance Centre (PC) levels. They are ably supported by other qualified Club coaches and other volunteer helpers – Club players and parents. We also benefit from the support of students completing their Junior Sports Leader or Duke of Edinburgh Award Schemes. Our Junior teams are run by parent volunteers ably supported by our more experienced junior and/or adult players. We are alway interested in receiving support from volunteers to coach, help or run teams. If you would like to support our juniors, please don’t hesitate to speak with a coach or contact our Club Sec. We believe that young players need to experience the buzz of competition. So, in addition to the regular coaching sessions, each young player will have the opportunity to play competitive hockey in their age group U10, U12, U14, U16/18. We entered our teams into local and regional Tournaments, Leagues or Festivals depending on the age group and the availability of volunteers to organise the team’s participation. We encourage our juniors to compete at their own age group level. In exceptional cases, we will encourage players to play “up” an age group to help support their development. We also encourage our most able players, once they reach 13 years of age, to start training at senior training and to play senior league hockey. We invite juniors who are ready to progress to senior hockey to attend senior training. Typically our youngest players will be introduced to play senior league hockey in the lower teams. These are designated as the Club’s “Development” teams. The teams are set up with a mix of senior and junior players players to help those new to the senior game to acclimatise, boost their confidence and develop their hockey skills. It is not unusual to see our most talented juniors playing regularly in the Men’s and Women’s 1st XIs. 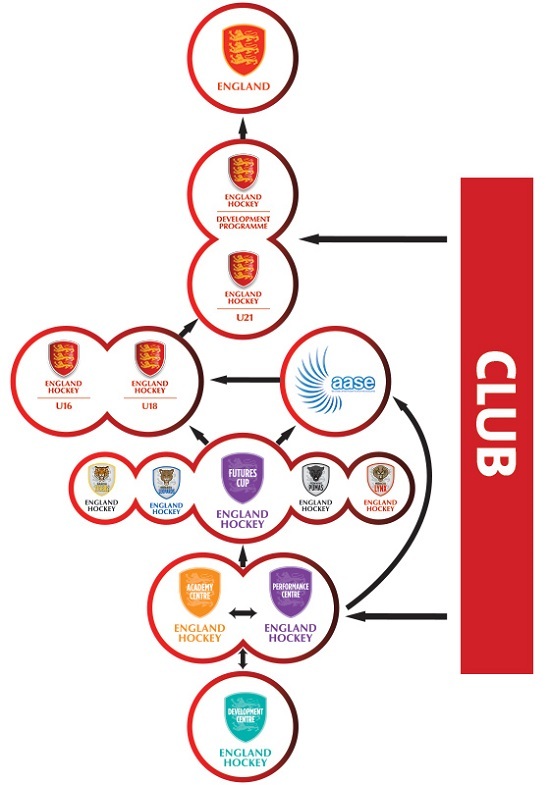 We actively promote England Hockey’s Player Pathway for those juniors who we believe show the necessary potential. See here for details of what it means for young players in Devon. The single point of entry point to the Player Pathway in Devon is the Development Centre (DC). These Centres take place locally. For those successful at AC, the next level for U15 & U17s is the Performance Centre (PC).